Cervical cancer rates in the United States are higher than previously believed, particularly among 65- to 69-year-old women and African-American women, according to a study led by a researcher at the University of Maryland School of Medicine published in the journal Cancer. Current U.S. cervical cancer screening guidelines do not recommend routine Pap smears for women over 65 if their prior test results have been normal. Previous research finds an age-standardized rate of about 12 cases of cervical cancer per 100,000 women in the United States, with the incidence reaching a peak at age 40-44 and then leveling off. However, these estimates included women who had hysterectomies in which the lower part of the uterus, the cervix, was removed. By excluding these women, who are no longer at risk of developing this cancer, from their analysis, the researchers calculated a rate of 18.6 cases of cervical cancer per 100,000 women. They found the incidence increased steadily with age and peaked at a higher rate and at an older age, specifically in women 65-69 years old. “The higher rates of cervical cancer after correction for hysterectomy highlight the fact that, although a large proportion of cervical cancer has been prevented through early detection and treatment, it remains a significant problem,” the authors conclude. 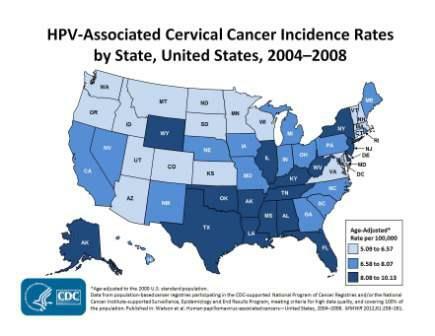 Human papillomavirus (HPV) infections cause virtually all cervical cancers, and the researchers stress the need for widespread HPV vaccination to protect women against the virus. The incidence of cervical cancer for women ages 65-69 was 27.4 cases per 100,000 women, 84 percent higher than the uncorrected rate of 14.8 cases per 100,000 women. Among white women ages 65-69, the rate was 24.7 cases per 100,000, compared with an uncorrected rate of 13.5 cases per 100,000. The rate for African-American women ages 65-69 was 53 cases per 100,000, compared with an uncorrected rate of 23.5 cases per 100,000. In fact, African-American women had higher cancer rates at nearly all ages compared with white women, and the disparity was more pronounced at older ages, likely attributable to African-American women reporting a higher prevalence of hysterectomy than white women. “Our corrected calculations show that women just past 65, when current guidelines state that screenings can stop for many women, have the highest rate of cervical cancer,” says the study’s lead author, Anne F. Rositch, Ph.D., M.S.P.H., an assistant professor of epidemiology and public health at the University of Maryland School of Medicine and a researcher at the University of Maryland Marlene and Stewart Greenebaum Cancer Center. “It will be important to consider these findings when reevaluating risk and screening guidelines for cervical cancer in older women and the appropriate age to stop screening.” Patti E. Gravitt, Ph.D., a professor in the Department of Pathology at the University of New Mexico Health Sciences Center, is the senior author. The researchers say that failing to correct for hysterectomies not only underestimates the true incidence of cervical cancer but also results in misleading race and age-specific comparisons. The researchers analyzed data on cervical cancer from 2000 to 2009 from 18 registries within the Surveillance, Epidemiology, and End Results (SEER) program of the National Cancer Institute (NCI), part of the National Institutes of Health. The data in the 18 registries represents approximately 28 percent of the U.S. population. The researchers generated estimates of hysterectomy prevalence from the Behavioral Risk Factor Surveillance System (BRFSS), a household survey conducted by the U.S. Centers for Disease Control and Prevention. Cancer is a peer-reviewed journal of the American Cancer Society. The research was supported by the NCI (RO1 CA123467), the Institutional Research Cancer Epidemiology Fellowship funded by the NCI (TE32 CA0009314) and the Career Development Award for Bridging Interdisciplinary Research Careers in Women’s Health (K12 HD043489-12). Established in 1807, the University of Maryland School of Medicine is the first public medical school in the United States, and the first to institute a residency-training program. The School of Medicine was the founding school of the University of Maryland and today is an integral part of the 11-campus University System of Maryland. On the University of Maryland’s Baltimore campus, the School of Medicine serves as the anchor for a large academic health center which aims to provide the best medical education, conduct the most innovative biomedical research and provide the best patient care and community service to Maryland and beyond. The University of Maryland Marlene and Stewart Greenebaum Cancer Center, a National Cancer Institute-designated center in Baltimore affiliated with the University of Maryland Medical Center and University of Maryland School of Medicine, offers a multidisciplinary approach to treating all types of cancer and has an active cancer research program. It is ranked in the top 50 cancer programs in the nation by U.S. News & World Report.